Steampunk is a literary genre that has its roots in Victorian era science fiction writers like Jules Verne, Mary Shelley, and H.G. Wells. Ther term Steampunk came along in the 1980s for a specific style of writing that revisited these earlier times of the industrial revolution as an alternative history, imagining great works of fictional invention based on cogs, gears, clever contraptions, steam engines and hot air balloon travel (airships). Later many video and role playing games visited this theme as well. The The Steampunk Tarot promises to offer a glimpse of the future through a lens to the past with unique digital artwork. 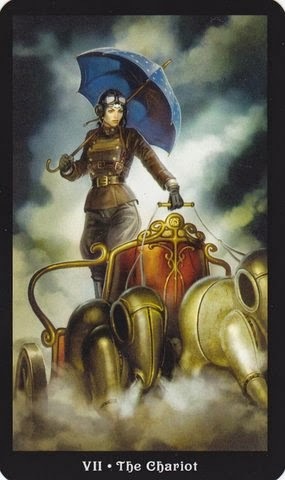 The chariot in this deck is a mechanical vehicle with brass horses exhaling steam through their equine nostrils. A female driver wearing a goggled helmet holds a blue umbrella and steers the transport with her free hand.